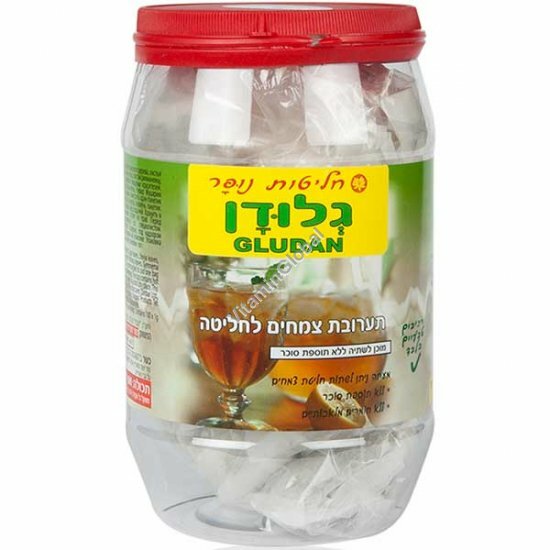 Nufar - Glucodan (Gludan) Tea for reducing blood sugar levels! Glucodan tea is a natural mixture of medicinal herbs for reducing and balancing sugar levels in the blood. Glucodan Tea reduces sugar and breaks down carbohydrates and fats which rise dangerously immediately after meals. 1. Rehabilitation and activation of the pancreas. The tea's special formula causes a discharge of a required quantity of insulin by the pancreas. Insulin helps the cells absorb sugar to produce energy and spur cell construction. This process reduces the sugar levels in the blood. 2. Reduction of the body's resistance to insulin. The metabolism of diabetics (and those who have a tendency towards diabetes) starts creating a natural resistance towards insulin. In other words, the body resists insulin absorption, and thus the effectiveness of insulin on the cells decreases. As a result, sugar remains in the blood and not absorbed in the cells, thereby elevating the body's blood-sugar level. The ingredients in Glucodan tea allow the body's cells to react to insulin, i.e. to absorb and break down sugar, thereby stabilizing the levels of sugar in the blood. In addition, Glucodan tea contains Stevia leaves which makes it naturally sweet and tasty without adding to the levels of sugar in the blood like the usual sweeteners found in most beverages. Stevia: reduces sugar levels in the blood by activating and rehabilitating the pancreas. In addition it decreases the body's resistance to insulin. Stevia has a sweet taste, but because stevioside doesn't get digested by our body, it has no calories and doesn't increase the sugar levels in the blood. On the contrary, it reduces them. Salvia Fruticosa - lowers blood sugar levels. Contains flavenoids which function as anti-oxidants. Salvia is effective against infections; it has an anti-viral and anti-bacterial effect; it is a diuretic as well. Olive Leaves - Reduces blood sugar levels. Contains flavenoids which are necessary for the maintenance of the capillary blood vessels and especially for the protection of the problematic blood vessels of diabetics . The anti-oxidants which are in the olive leaves delay arteriosclerosis and prevents heart disease. Inula Helenium - contains Polysaccharide: Inulin. Reduces Sugar levels, Antiseptic, Anti-Bacterial, Diuretic, Increases the discharge of the Gall bladder's fluid. The Inula Plant also decreases blood pressure and stimulates the immune system. Lemon Verbena - - a soothing plant which has a taste of a lemon. Used in order to add flavor to the formula. Lemon Grass - Rich with anti-oxidants; a soothing plant which also has a taste of a lemon, and is used in order to add flavor to the formula. Eucalyptus - contains an antiseptic active ingredient - Eucalyptol. Known by its healing characteristics. Gymnema Sylvestris - The most significant herb for treating Diabetes. Reduces sugar levels in the blood. This Plant has an ability to renew Lengrahans cells in the pancreas. Stimulates pancreatic insulin discharge from beta cells, lowers appetite and desire for sweets. The Gymnema Plant contains a mixture of Saponins which is called Gormerin. This mixture has polypeptides which contain 35% amino acids. This product contains natural Stevia leaves and therefore there is no need for a sweetener. Should not be used by Pregnant and Nursing Woman. Contents: 100 tea bags, 1 gram per bag (= 100g).